This is exactly what I have, on the back of a 4-2-1 manifold. It does sound awesome and is pretty loud when you boot it, if you drive sensibly and poodle around town in 3/4 or cruise at 70-80 on the motorway I don't think its too loud personally. Also, it would be cheaper if you buy directly from CCI if you're a member. Maybe, I mean it ultimately depends on how long this current exhaust lasts. If it falls apart before I have enough money saved to get a stainless system made then I'll have to go with the cheaper option as a matter of urgency. Who gave you the quote for the stainless system? When I was considering getting one before, nobody would respond to emails (because why would they in 2018 after all? ), and shopping around going to garages and interacting with actual people or doing phonecalls is not something I'd be able to do (being autistic, talking to people in person is something I avoid at every cost, especially strangers, so that can be quite prohibitive), would much prefer just ordering something online and cutting out human interaction almost completely if possible, which is also an upside to getting the cheaper option off of eBay lol. I'm not a member of CCI, never really saw the point as what they sell seems to be just as expensive or more than other sources. Someone who was a member offered to order something for me once before, and after they had added on an obscene shipping charge, even with their "member discount" it still came to more than what it would cost to get from somewhere else so I gave up on the idea, as the benefits seemed like a bit of a con in that situation. Aren't there insurance implications with getting a stainless system? Wouldn't that be classified as a modification and have to be declared to the insurance company? Arya2.0S wrote: Maybe, I mean it ultimately depends on how long this current exhaust lasts. If it falls apart before I have enough money saved to get a stainless system made then I'll have to go with the cheaper option as a matter of urgency. The quote I got was from Powerflow I think, they have branches up and down the country, usually smaller garages agree to their terms and work under that name to offer the service and get the business from the name people know - I called and asked how much and they told me £350 from manifold back, would be custom made to fit the car as well not just an off the shelf piece. The one I have has lasted alright, I'd expect it to have a lifespan of 5-10years (being very ambitious!) if driven everyday like mine mostly is. Alright, cool, thanks. I'll have to think about it again and see where circumstances take me. We're also saving up for a move too you see which will also take priority over a shiny new exhaust, and if it means making a compromise and getting the cheaper system in favour of getting the hell out of this soul sucking shitehole of a town then I'll definitely do that, but we'll see. Arya2.0S wrote: Alright, cool, thanks. I'll have to think about it again and see where circumstances take me. We're also saving up for a move too you see which will also take priority over a shiny new exhaust, and if it means making a compromise and getting the cheaper system in favour of getting the hell out of this soul sucking shitehole of a town then I'll definitely do that, but we'll see. You said that twice Dan but I must say your exhaust manifold does look good I wonder if your get better MPG as it keeps the engine cooler ? Might be a small amount or could be a few more MPG . Jasonmarie wrote: You said that twice Dan but I must say your exhaust manifold does look good I wonder if your get better MPG as it keeps the engine cooler ? Might be a small amount or could be a few more MPG . My bad! I must be getting more useless with this tech malarkey in my old age! Funny as I have been checking mine and it’s been around the 33mpg I do use super unleaded what is more expensive . But yes Dan ,Enjoy the sound and thrill . It’s worth every penny . I can’t wait till Monday for MOT at Tickover Tuesday going to drop in the afternoon but going down to Whistable first with Dad to have breakfast any excuse to give her a run . My other half has recently started her driving lessons and wanted to get her own car sorted, of course it had to be the blue oval! I am pretty jealous as I love these little things and for the princely sum of £650 for a car that has only done around 36k miles it was a bargain! 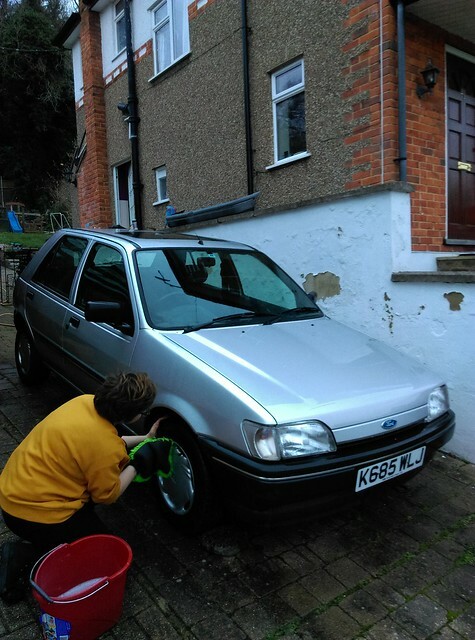 Great little car and so easy to work on , yes great car to start with I have been looking for my son at fiestas ..
That looks in great condition, and £650 represents terrific value for money. It is in really good nick to be fair! one small scratch on the bonnet and a tiny bit of surface rust on the rear arches, but I've sanded that back and treat it with some Loctite anti rust paint before I fill it and spray it over - should keep the tin-rot away! Also I've got some HFVP (don't tell Nick!) and re-sprayed the rear bumper as it had faded terribly so will be re-attaching that after I've given it another couple of coats, also thinking I should probably lacquer it to protect it better. I'm immensely jealous as I love those little cars and is one of the first things I remember my mum driving me around in when I was a kid! I said the same thing Andy, should easily see the money back if she sells in a few years, provided she looks after it! Great little car Danny, is it a 1.3 pushrod engine or the 1.25 twin cam zetec? Paul G wrote: Great little car Danny, is it a 1.3 pushrod engine or the 1.25 twin cam zetec? Even titchier! 1.1 HCS with a carb on! If I had it my way it would have a Zetec and XRi bodykit! Andrew 2.8i wrote: That looks in great condition, and £650 represents terrific value for money. It’s amazing what can be found for less than £1k. Nice buy Danny, hope she enjoys it. It has been stripped ow and I've been told that the big end and main bearings on cylinders 1 and 4 are worn, but the crankshaft is still within tolerance. I was looking at getting the head converted/valve seats hardened to run on unleaded but at a cost of £6-700 I think I'll leave that for now! !